Tópico: Is this Brazilian-created ad offensive? 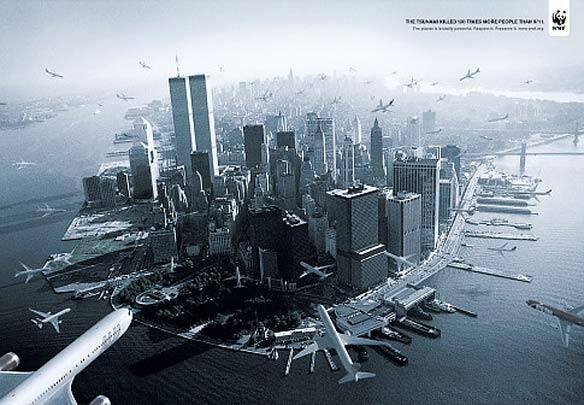 This ad, created on spec by a Brazilian ad agency and rejected by WWF, is captioned: "The tsunami killed 100 times more people than 9/11. The planet is brutally powerful. Respect it. Preserve it." Re: Is this Brazilian-created ad offensive? Surelly will not gonna atract US citizens to the "cause". Long time no see, Galileo. I don't quite grasp how it could be offensive. I don't see anything demeaning in the comparison between victims from the Suriname and from NY, neither with victims of a terrorist attack and victims of a natural disaster. Perhaps it makes natural disasters sound as a sort of terrorist menace, but I think it's a stretch. Maybe not, since it got to be something. I don't quite grasp how it could be offensive. 1. USians have a kind of apocalyptic reverence for the attacks on the World Trade Center. They think it's a sacrilege to refer to the event or use the image of the Twin Towers in any kind of advertising - even for a non-profit, non-commercial, or charitable purpose. It's not unlike the way some Muslims reacted to the Danish cartoons. 2. USians believe 9/11 was an unspeakable horror of incomparable proportions - largely because they are ignorant of the massive amount of death and suffering that goes on every day around the world, much of it caused by their own government's military and economic policies. Also because they don't regard the lives of brown and non-Christian people who live far away to be of comparable value to their own lives or the lives of their fellow Americans. Consequently, they hate to hear anybody tell them that, for example, as many people die every 26 days on US roads as died in the terrorist bombings of 9/11, or that the 2004 tsunami killed 100 times as many people as the 9/11 terrorists, or that every two weeks the casualties in the iraq and afghanistan wars exceed the death toll on 9/11, etc. 3. USians (outside of New Orleans) believe they are personally more at risk from terrorist attacks than from tsunamis or other natural disasters. They think it trivializes terrorism to compare it with natural disasters. 4. Deaths caused by terrorism are worse than deaths caused by tsunamis, because tsunamis are caused by God. Terrorists=evil; God=good. Yeah. It must be something along these lines, really, which is sad. The other possibility is that it would be offensive agaisnt terrorists, by comparing their "purposeful" actions with a tragedy that lacks any meaning. But that's very unlikely to be the case, something that would be said only by some parody, a leftist counterpart of Stephen Colbert, parodying Michael Moore instead of Bill O'Reilly. Here's another one I found along the same lines. An anti-smoking ad that was rejected. (This one has no connection to Brazil, as far as I know). Página criada em 0.123 segundos com 23 procedimentos.